Experience a triple-powered capsule of youth that focuses on enhancing skin's barrier repair function, increasing moisturization within the surface of the skin and minimize the appearance of aging signs.This lightweight, silky-smooth serum helps to maintain healthy, youthful-looking skin and correct the visible signs of aging by delivering a new and improved blend of ingredients your skin needs to target skin barrier repair, moisturization and anti-aging. Each capsule is biodegradable and fragrance- and preservative-free, designed to deliver a concentrated dose packed with even more advanced ceramide technology. Imagine a brick wall. After years of exposure, the mortar between the bricks starts to break down. Your skin is no different. As you age, ceramides (the mortar) aren't produced at the same rate, resulting in a noticeable decline in ceramides by your 30s and an even more dramatic decline by your 40s. Your skin begins to weaken and form wrinkles, dryness, uneven skin tone and loss of firmness. Elizabeth Arden's innovative Advanced Ceramide Capsules have the power to help replenish and restore the ceramides your skin loses with age. 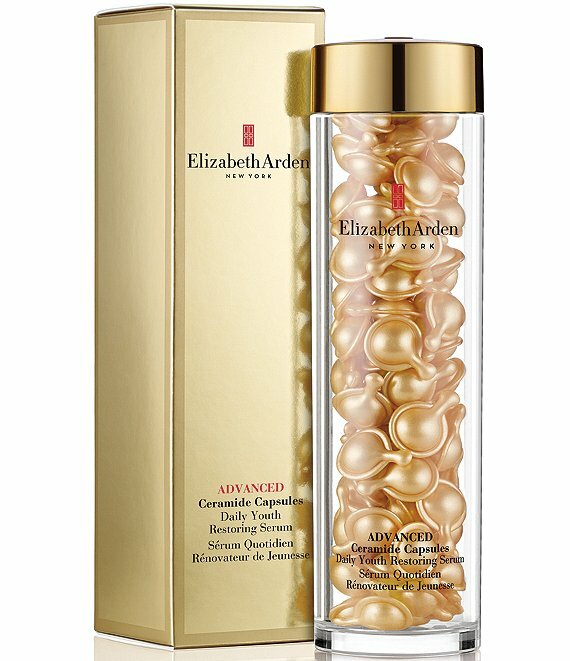 Elizabeth Arden's skin-identical ceramide technology helps strengthen skin's moisture barrier layer with what it needs for a youthful-looking appearance. Revitalizes and re-texturizes the look of skin. Noticeably smooths and softens skin. Application & Use: To open the capsules, gently twist tab around twice and squeeze onto fingertips. Smooth serum over cleansed face and neck morning and night before your moisturizer.